Does anyone know what this is? They are very small, dark brown with a whitish band around their middle (that doesn't go to their underside). I know they were eating the parsley because, although no holes in leaves, they "pooped" and when I ran my finger over it, it left a green trail. 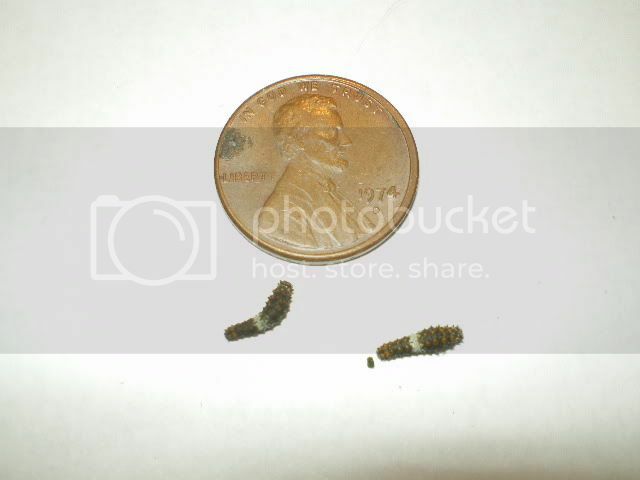 Most definitely Black Swallowtail caterpillars in one of the first 3 instar stages. I always grow extra parsley, carrots, dill, fennel, as well as Golden Alexander wildflower and move these Babies from parsley and carrots and dill I want to save to their own plants. You can also raise them on carrot tops in a narrow neck bottle of water. One didn't make it, but one did, and I'd rather leave him where he is. How much parsley will he eat? He's still working on the first plant, and there are two others plants in the same container (plus several more right next to this one). He's already 5x his original size and has gone through his first molt. Now he's a much prettier white/black/yellow-orange stripe. My sister, who lives in VT, was trying to explain to me how I should move him and the plants into a fish bowl or aquarium, give him a vertical or diagonal stick to attach to, and watch him (in his chrysalis) all winter, making sure he's protected from any bad weather (I guess he stays outside) until he emerges next spring. Do you think she is talking about the same kind of swallowtail I have here? Would the process be the same here in Missouri? I don't want to bother him if he would be OK on his own. There are a number of predators that can harm the caterpillar. Most obvious being birds and spiders, but also parasitic insects (which we call beneficial insects in the garden) like Tachnid flies and Brachonid wasps. My kids and I raise Monarch butterflies every summer~fall to tag and release. We found that it's imperative to collect eggs and 1st~2nd instar caterpillars and bring inside to raise because otherwise, they disappear from the garden. We always bring a small number of Black Swallowtails to raise as well. 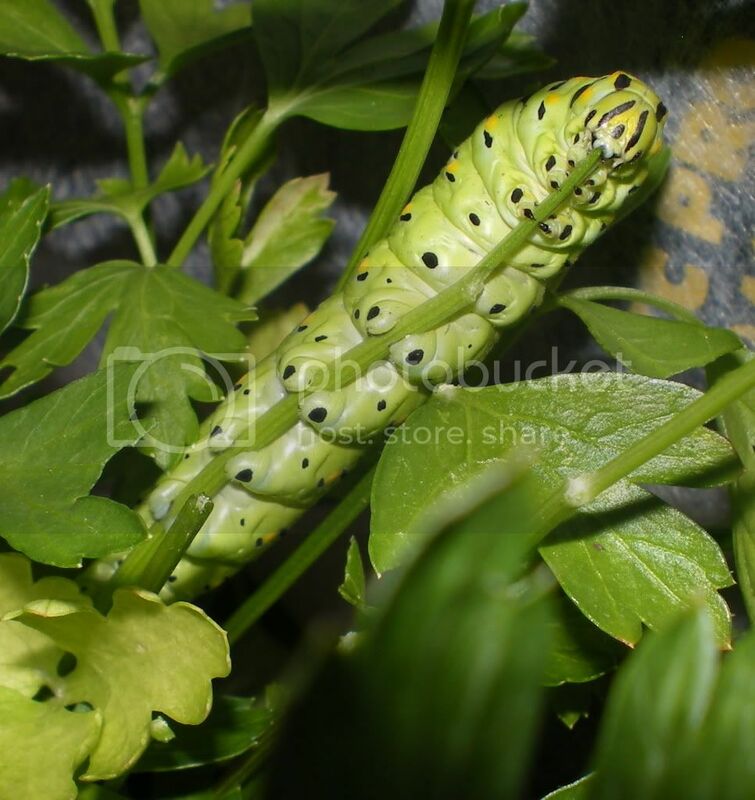 Black swallowtails initially do well in tall jars like pickle jars or 1/2 gallon canning jars. I trim the long stems of parsley, dill, and carrot tops and put them in narrow-necked bottle of water (I like 2 oz. brown tincture bottles). The mouth of the jar is covered with cheesecloth and rubber band. Typically, they will need to be given a new leaf every 2 days in the beginning, but by the time they reach 4th instar, you'll be kept busy. Usually, when they pupate and make a chrysalis, they'll just hang on to one of the stiff leaf stems. 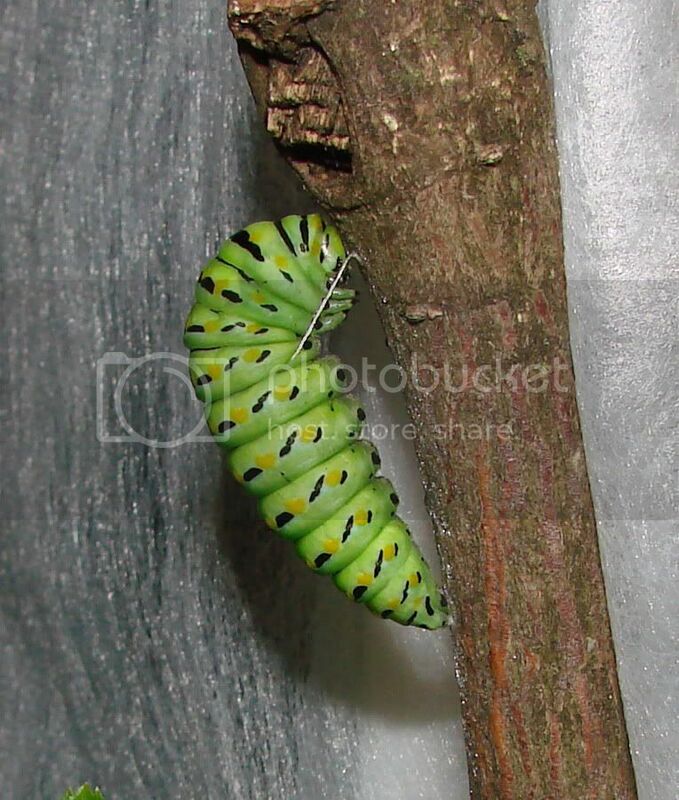 If the chrysalis is lime green, the butterfly will eclose/emerge this season. If the chrysalis is dried grass tan/brown, then it will not emerge until next spring when it's at least warm enough to plant out tomatoes, maybe even peppers. I just keep them in the house, but in a cool room with minimum artificial light. Last winter, I made the mistake of leaving a chrysalis in a Southeast exposure upstairs room with tropical plants that received supplemental light until bed time, and the poor butterfly emerged in the middle of the winter (late Feb). I tried to keep it alive by providing sugar water and Melon-flavored Gatorade (strangely, this is the recommended butterfly food according to Dept. of Entomology in a Florida university, I forget which), but it died after about 10 days, which I think is actually about average lifespan for these guys. (Monarchs can live for 8+ months). 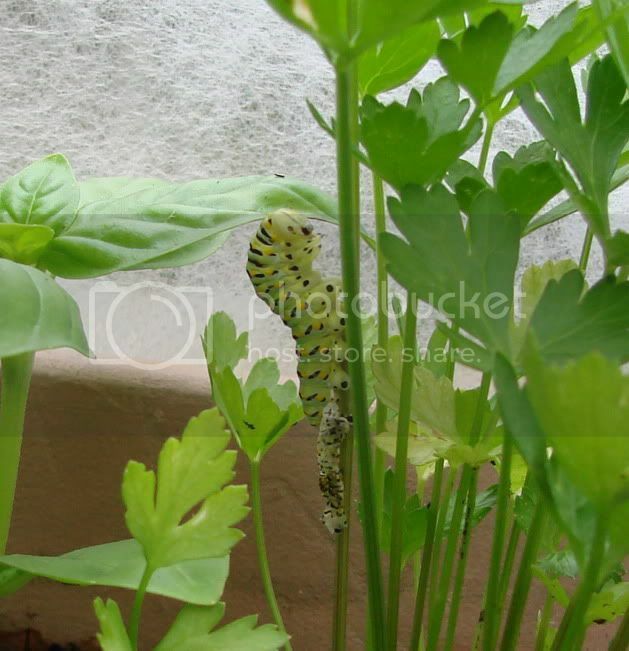 If you end up raising many caterpillars, I recommend you get a Butterfly Garden or Pavilion from www.insectlore.com or you can use a pop-up laundry basket turned upside-down, or make your own cage with a tomato cage wrapped in tulle, or with tulle and embroidery hoops. (There are many DIY ideas). I wish I could know before he pupates whether or not he's coming out now or next spring. I read on the Internet that those that overwinter are usually late summer swallowtails, not this early in the summer. Is there anyway to know for sure, based on the stage he's in right now (somewhere between 3rd instar and full grown)? I don't want to disturb him if I don't have to, but I also don't want him to fall prey to a bird, spider or wasp. Here's a thought: what if I build him a "teepee" out of tall sticks and light row cover so he can stay in his current location? (It's an herb garden just outside my back door, like a window box, but I hang it over my deck railing.) I could put the sticks right in the soil (to a height of about 10 inches) and drape the row cover over, secure it on three sides and put small rocks on the end I want to open to check on the cat or water my plants. He'd have several sticks to choose from as well as his favorite food -- unless he's going to go through more than 3 parsley plants! If you think he might be one that emerges in the next few weeks, can you foresee any problems with this arrangement? Oh this one's definitely going to pupate and emerge this summer. It's way too early for overwintering. Notice that the color of the chrysalis is intended to camouflage. I'm soooo glad I checked here before I did anything. I found these yesterday when I was pulling weeds...sure glad I didn't destroy them as was my first impulse to do! This is my first herb garden. It's great to have ya'll as a resource. Thanks for the info! Questions: Mine look like the last picture. About how long will it take them to turn in to butterflies? Will they form a cocoon on the dill stem? You'll note that none of them give an exact timeframe between life stages for the catepillar, except to say he will pupate for about 8-12 days. Until mine finds a stick and starts his metamorphosis, I have no way of knowing how much longer it will be. Sorry, that last URL is the main page of the first site listed (but the first link is more specific to black swallowtails). SLG, with all the cat' photos I have, I've never taken one from the angle of your 2nd photo-- oohh he (or she ...I should find out how to tell in cat stage) is sooooo cute! Have fun! ... And you, too, Z! Well, I got my answer yesterday afternoon when the cat went exploring and finally (after climbing up and down for what seemed like forever) found a stick to his liking ... and stuck! (Of course, he picked one of the larger sticks that's holding up the row cover "teepee" but I guess that's OK.) He also didn't climb too far up. How do I know if he'll have enough room to hang so his wings dry? I've ordered a hamper from Walmart (like the butterfly cage, only bigger) but not sure it's going to get here on time. 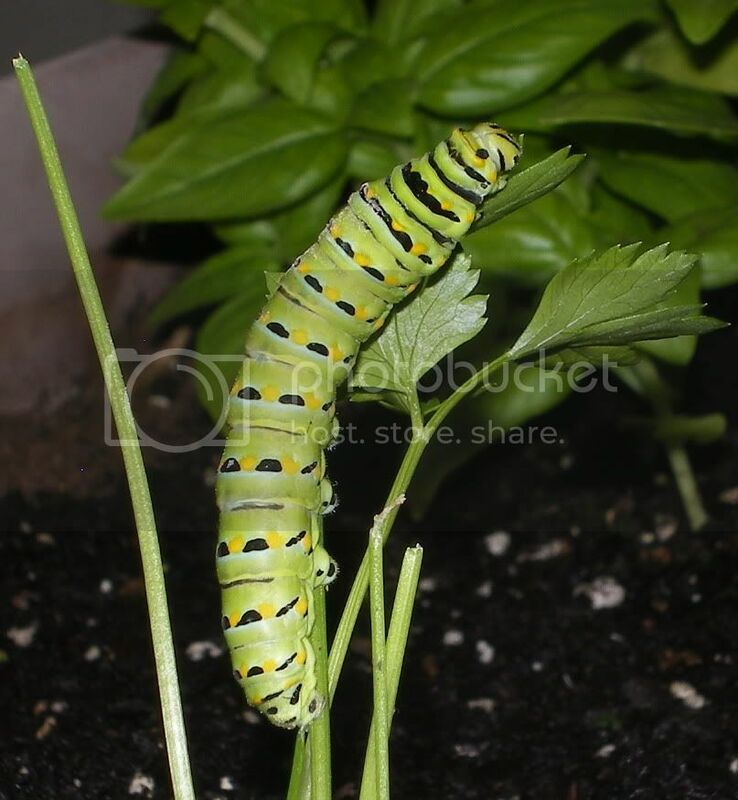 If it does, can I safely remove the chrysalis stick from the herb garden and place it in the hamper at an angle so he has more room to stretch his wings, etc. when he emerges? Lots of questions, I know. Once I have this first one behind me, I'll have more confidence. I've already planted more parsley where this cat ate it down to the stems, so hopefully I will get more of these wonderful creatures to visit my yard. Were you amazed by how much shorter/smaller he became as a chrysalis? Let the it harden for 24 hours then you can remove the stick, trim if necessary, and what I do is tie it on to the inside wall of the cage with a thread -- tie securely to top and bottom of the stick. Poke the thread through the netting at appropriate height -- I'd say approximately 8" or higher. No, I wasn't surprised because I'd seen the website photos. But the silken thread holding him on is really cool when viewed in person. Should I be concerned that he has looked the same as in the last photo for a good 12 hours already? No change/chrysalis formation yet. I have him in the warmest room of the house; a thermometer on a shelf there reads 80 degrees this morning, but I'm not sure how accurate it is. Is that warm enough to speed things up? I can open the blinds to let the afternoon sun in to raise the temp. Thanks for the info and websites! We have 9 of these little guys! I'm wondering if they will be ok on the dill...or if I should put some sticks in the garden for them? The dill that they are on (most of them anyway) is pretty large and sturdy. I think I'll put sticks right next to the dill plants they are on so they can choose. Again...thanks for all the info!